Article and main image photo credit: Ben Forrest of Skies Magazine. Article posted June 18, 2018. Photo credit (below): Erik Woods of Skies Magazine. 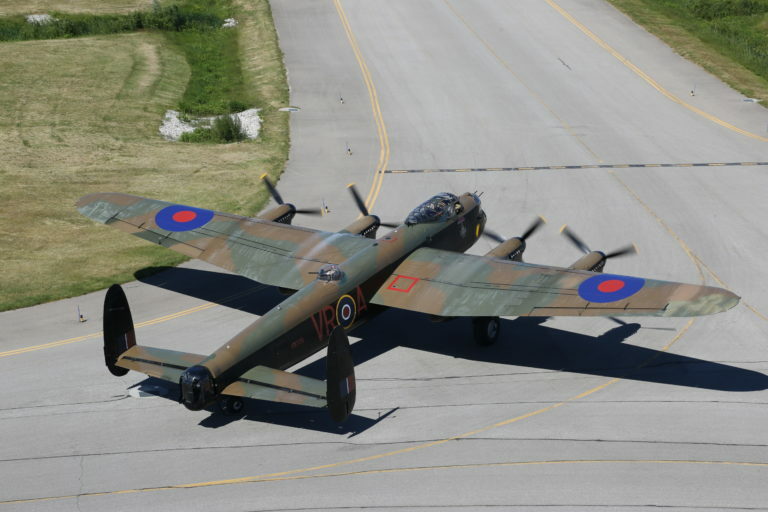 As the late-morning sun heated the tarmac at Region of Waterloo International Airport on June 15, Phil Etheridge stood under the left wing of Avro Lancaster C-GVRA and thought about what it might have been like to fly the aircraft seven decades ago. Etheridge, 67, a former production manager with Chartright Air Group, was minutes removed from his first-ever flight in the Lanc, a short hop from Canadian Warplane Heritage Museum in Hamilton, Ont., to Waterloo for the 2018 Canadian Business Aviation Association (CBAA) Convention and Exhibition. “You have to think back,” said Etheridge, peering out from a pair of dark aviator sunglasses and dressed in a green bomber jacket that belonged to his father Norm, lead engineer on the crew that restored C-VGRA to flying condition. “Here we are flying on a beautiful summer day in the daylight with five of us in the airplane,” said Etheridge. “To think that at one point 70 years ago they were flying at night, in the dark, eight crewmembers, and when something would go wrong–there’s not a lot of room in that airplane. C-GVRA, better known as “Vera,” is one of the rarest aviation artifacts of the Second World War, one of only two Lancasters in flying condition and one of only a handful of surviving aircraft from the wartime production line at Victory Aircraft in Malton, Ont. Norm, who passed away in January 2017, guided a crew of dedicated volunteers who overhauled and restored Vera after the museum acquired it from the Royal Canadian Legion in Goderich, Ont., in 1977. “Once he got into it … it became a labour of love,” said Etheridge, who is also an aircraft maintenance engineer (AME) and has been with Chartright since 2008. Vera was transferred to the museum after spending years on outdoor display in Goderich, a small town on the shores of Lake Huron, and restoring it to flying condition was no small task. Eleven years passed before the aircraft officially returned to the skies on Sept. 24,1988. Since then it has flown an estimated 1,800 hours, many of them with members of the public who pay $3,500 per hour, plus $125 for a museum membership. Norm’s initial goal was to have the plane available to fly to England, said Etheridge, home to the world’s only other airworthy Lancaster bomber. That dream came true in 2014, when Vera flew with PA474, a British-built Lancaster operated by the Battle of Britain Memorial Flight (BBMF) at RAF Coningsby in Lincolnshire, England. Norm watched the flights from a seniors home in Ontario but Etheridge went to the U.K. as a family representative and watched from the ground. “It meant a lot when I was at Middleton St. George the night the airplane arrived,” said Etheridge, referring to the village and former RAF base where BBMF is located. Despite his family’s close connection to Vera, Etheridge had never flown with her. When a colleague from Chartright worked with ***Skies*** and the museum to arrange his flight and shared the news, Etheridge was beyond words. The flight itself was cramped and noisy, he said. Vera is barely large enough for the average person to stand up in, and he had no words to describe the noise emanating from its thundering Packard-Merlin engines. “I wouldn’t want to say it was a culmination, but it certainly was an exclamation point in what [the museum] considered my dad to be,” he said. “There’s not many people in this world that have a living memorial to their family, and we do. Those rumbling engines are indescribable, he said. But he and his family know it well enough to spot Vera without seeing her. “We’re out and about in the countryside, and we’re downtown Toronto during the Ex [the Canadian National Exhibition] and you can hear her coming,” he said. Click here to read the article on Skies Magazine‘s website.